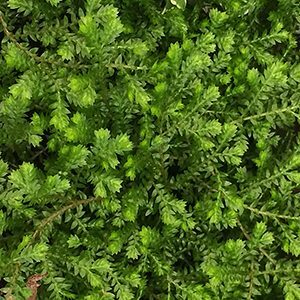 A very useful ground cover plant for a part shaded position Selaginella kraussiana with its soft mossy foliage is commonly called Green Club Moss. Reaching around 5 – 7 cmd in height it does like a humus rich moist soil. Its natural low growing nature and preference for low light make it a great plant for beneath taller ferns when grown indoors. Very useful in a fernery as a ground cover, or in a shaded moist position in a garden or courtyard. Grow it a a green carpet between pavers. This is also a popular plant for use in terrariums. It does have a natural spreading habit however is easily contained and removed. A variety with golden tips on the foliage is also available. We have seen Green Club Moss sold as a tea, it is said to improve memory. In good conditions this is a very low care plant. Keeping it moist, and feeding every two months with a liquid seaweed fertiliser is about all Green Club Moss requires. In colder climates, if grown outdoors it can tend to die back in winter, however it will bounce back in spring. Propagation by division of established clumps is easy. The best time to do this is in spring as new growth commences.